Towering over 900 feet above Toronto’s financial district on Bay Street, the Scotia Tower is an architectural icon in the realm of Canadian banking. Covered in a rusty Napoleon granite quarried from Sweden, the tower resonates the trademark colours of the bank, whose name it bears. Inside the main entranceway, the shimmering floors are also composed of red granite, giving visitors a luxurious impression when they enter the office building. Bank towers are known for their attention to detail, luxury, and finish; the reason for this is that in order to instill a sense of trust in their clients, banks invest great deals of money in the design of their office buildings. The investment in their space can be considered an investment in their future and their clientele; a bank that wasn’t financially secure for the foreseeable future wouldn’t bother wasting all that money on marble floors and cherry desks. All businesses can take a lesson from banks. Even if you can’t afford exquisite flooring or office furniture, every business can afford some form of cleaning services, and that starts with commercial floor cleaning. Why start with the floor? While all cleaning services are important, the condition of your floors says the most about the state of your business. The shine from a floor after professional cleaning services is one of the first things any customer will see. Any unpleasant odours caught in the office carpet will be steam cleaned away by commercial cleaning services. In-house cleaning supplies can become dirty over time, and if you currently rely on employees to do cleaning, this may distract them from other work at hand or even lower morale. Regular cleaning services from a commercial cleaner like Sanitec Solutions will ensure that every customer’s first impression is a great one. 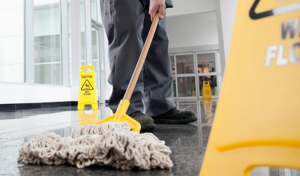 Commercial cleaning services can also provide a healthier work environment for your employees. Bacteria and other microorganisms can survive on all sorts of flooring surfaces like tile, carpet, or hardwood. A CDC study determined that floor cleaning was a key part of reducing infection transmission in hospitals by one-third. Some of the most common breeding grounds for bacteria and other infectious organisms were dirty mop heads and cleaning solution buckets. A company that provides commercial cleaning services like Sanitec ensures that all mop heads and buckets are regularly cleaned or replaced to reduce the prevalence of bacteria. Commercial cleaning services can also leave employees much happier. Cleaner offices are more pleasant to work in, and since the floor carries such a large part of that impression, proper cleaning services are key to maintaining this healthy work environment. Cleaning services provided by companies like Sanitec also provide business owners with a wide range floor treatment options, so your office floor will not be subject to the use of an improper product for the job. Cleaning services provided by a professional company like Sanitec Solutions will impress both clients and employees, and will contribute to a happier and healthier office overall. A wide variety of floor cleaning services are available, so contact Sanitec Solutions today at 416-253-0008 to request a quote for your business and leave your office looking brand new.